From its privileged vantage point on the third floor of Plaza Carlota, this warm and inviting penthouse condo in Las Catalinas offers unparalleled ocean views from its private, large rooftop terrace. The eight-person dining table and luxurious hanging couch there make this vacation home in Guanacaste a favorite spot for friends and family to enjoy daily happy hour, a classic tropical dining experience, and breathtaking sunset views. Featuring locally-crafted, genuine Costa Rican wood furnishing and finishes, this warm and inviting condo invites you to its spacious living room, in comforting soft blue, red and sunny yellow shades. There is a simple, unpretentious beauty to its living spaces, with echoes of Al-Andalus and a local flavor that effortlessly connects you to the surrounding nature. Move seamlessly from its famed social spaces to its lovely accommodations, ideal for a Costa Rican family vacation. The master bedroom features a king bed, en-suite bathroom, private terrace, and Juliette balcony with ocean view, the junior bedroom includes two single beds that can be turned into a king, and a pullout couch in the living room can be turned into a full bed. 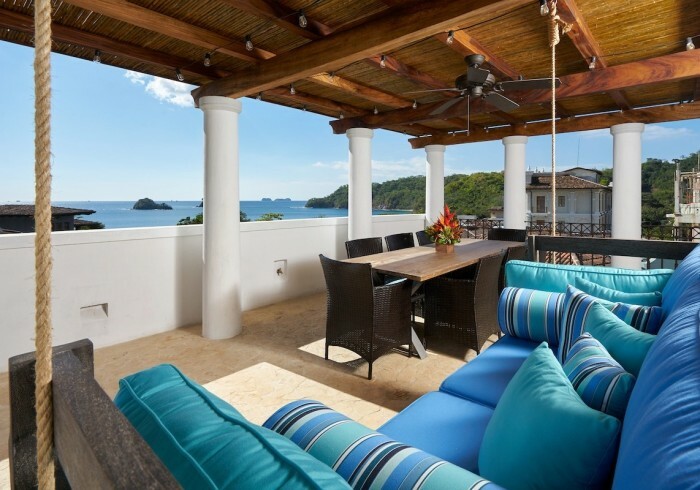 Full of light, color, and sun, this one of a kind penthouse at the heart of Las Catalinas, Guanacaste, offers irresistible sights of one of the premiere beach towns in Costa Rica. Up to six guests can be accommodated at this Carlota apartment, where children are welcome. Embrace the comfort of a private beach apartment in a picturesque setting, enjoying the wonders of Costa Rica the way it’s meant to be. From the privacy and quiet of your own apartment with full daily housekeeping service, let our dedicated concierge team help you plan the perfect vacation in paradise.